Similar to my cardigan, my Autumn sewing list has a focus on wardrobe staples. 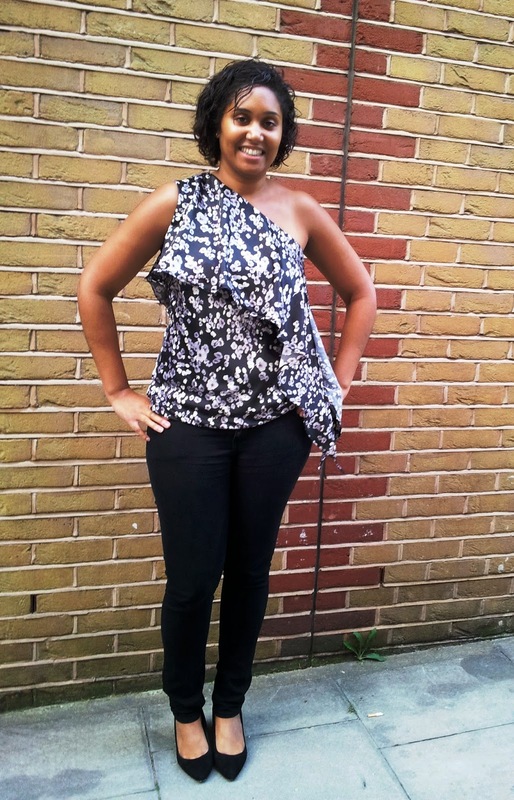 For my September Garment of the Month I decided to add in cute going out top. I do love a good dress, but as London can be pretty casual I often head out with a nice top and jeans. 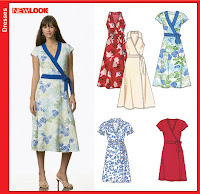 This pattern is McCalls 6562 now out of print. I purchased the pattern when it was on sale and only for view E. I know I complain about pattern envelopes a lot on this blog, but I do think that the other views are pretty strange? I like to think that it is the fabric choice as Cennetta's version is super cute. I mean look at this! It upsets me on so many levels. No wonder this pattern is discontinued. Anyway, enough of my ranting and more about the construction. This top is a wearable muslin. This is not a style that I usually wear, and looking at the line drawings I was worried that it would not be fitted enough. I sewed this version straight out of the envelope, cutting a medium and made no alterations. I am not too enthusiastic about the length. When I am standing it's fine, but when I sit down I expose a rather unsightly builders bum to the world. I know that if I lengthened it I would most definitely have to grade out to a size large on the hips. Another issue is the gathering at the back. As it is a loose-fitting top it does highlight the need for a swayback adjustment. I do find this even in loose fitting RTW tops, so it's not too surprising, although I would say that the gathering in the back is pretty pronounced. Luckily the flounces hide the majority of this. I have no idea what the fabric content is. I think that it is a satin/poly blend. I snapped this up in Shepherds Bush market priced at £2 during a fabric shop with my sewing group. It does drape pretty well and was really easy to sew with. I omitted the facings as it was a muslin, but I did decide to line it using some black stretch lining from my stash, picked up from Simply Fabrics in Brixton for £1 per metre. When I finished this top I was pretty unconvinced, but seeing the photos it's not as bad as I thought. I wore this out on a girls night out and it got lots of compliments. 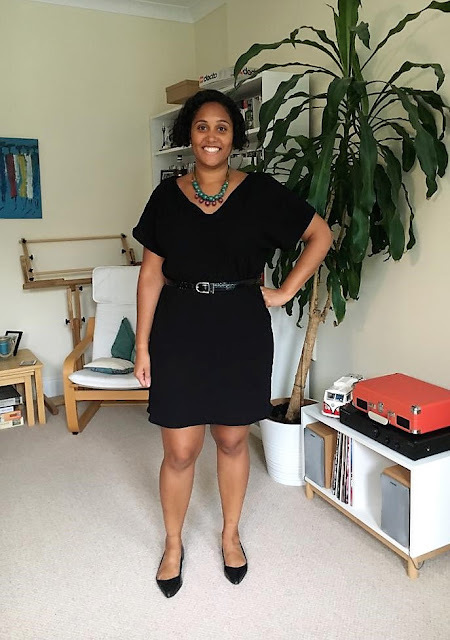 It's not a style that I am used to wearing and it does occasionally send me into a panic when I realise that I am not wearing something I can belt or that doesn't nip me in at the waist. 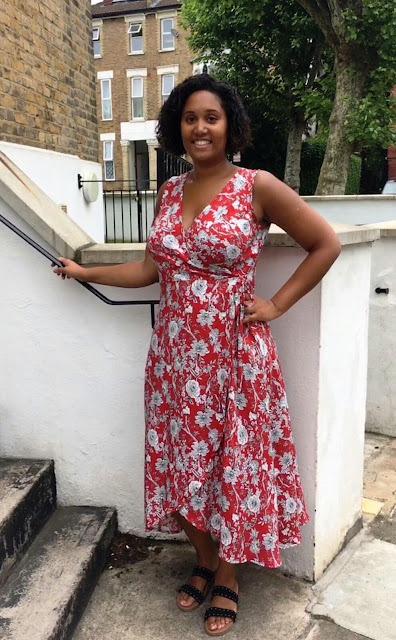 I don't think that I will be making this pattern again any time soon, but I am still pleased to have the top in my wardrobe and that I can tick off trying out an unused pattern in my stash. Plus, it is official that I am in love with invisible zippers. They go in so easily and mimic the majority of my RTW clothes. For my October garment I am treating myself to a TNT pattern - another version of New Look 6123. Have you been pattern stash-busting, or are you working with some TNT patterns to build your Autumn wardrobe? This wearable muslin is adorable! I think you look great in it. The outfit is adorable, Natasha; enjoy it!